Dr. Jake Messersmith will share how to motivate individuals and teams to do their best work. The University of Nebraska–Lincoln Executive Education program hosts four power lunches beginning in January, providing business professionals opportunities for strategic career development. The lunches, led by College of Business faculty members, offer ideas and approaches to help solve today’s business challenges. 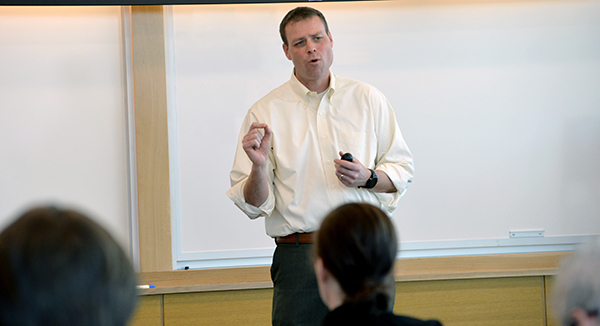 “Our programs allow professionals to develop a perspective on the challenges that many businesses face,” said Dr. Emre Unlu, executive director of executive education, associate professor of finance and Paul C. Burmeister Professor of Investments. Each 90-minute session costs $49, including lunch and parking validation for the 14th and Avery parking garage. Lunches and programs are open to all Nebraska and surrounding area professionals and students. To register, visit: business.unl.edu/powerlunch. The power lunch facilitators are highly-respected and experienced, and use research-backed, practice-oriented learning to enable skill development. These power lunches allow busy professionals an opportunity to gain the education and practice they need to accelerate their careers and grow their organizations. Positive Psychological Capital: Recognizing and Developing the HERO Within for Improved Performance and Well-Being, Wednesday, January 23, 11:30 a.m.-1 p.m.
Everyone agrees with the importance of being positive at work and in their life. However, most also feel such positivity is too “fuzzy” and ill-defined to realistically meet today’s complex challenges. Drawing from the science of positive psychology, Distinguished Professor Emeritus Fred Luthans founded what he termed Psychological Capital, or simply PsyCap, consisting of Hope, Efficacy, Resilience and Optimism, or the HERO within. He will provide an evidence-based understanding of how to develop PsyCap to make yourself a more effective positive leader of others with enhanced well-being. Talent Acquisition: Hiring for Strengths and Cultural Fit, Wednesday, January 30, 11:30 a.m.-1 p.m. Leading executives say a good cultural fit is essential when hiring new employees. Gallup research shows employees who work within their “Strengths Zone” not only look forward to going to work but they also work faster, have more positive, creative and innovative moments, treat customers better, and achieve more daily with accuracy. The challenge in talent acquisition is to make sure that potential employees match your culture and their Strengths match the position. Dr. Marijane Hancock, associate professor of practice in management and Gallup Certified Strengths Coach, will discuss interviewing and assessing job candidates for cultural and job fit. Moving Beyond Carrots and Sticks: Unlocking Motivation in the Modern Workplace, Wednesday, February 6, 11:30 a.m.-1 p.m. Does money motivate? Do financial incentives crowd out creativity and intrinsic motivation? Dr. Jake Messersmith, executive director of Business Graduate Programs and associate professor of management, will explore the latest research on the complicated relationship between financial incentives and employee motivation to offer insights into how to build an organizational culture and system that motivates individuals and teams to do their best work. Cracking the Code of Culture in the Workplace, Wednesday, February 13, 11:30 a.m.-1 p.m. If you work with multicultural teams or simply enjoy learning about global cultures, this session is for you! Dr. Elina Ibrayeva, associate professor of practice in management, will present several frameworks of cross-cultural differences including the most recent "Culture Map" model developed by Dr. Erin Meyer. Unlike most previous frameworks, this newest model is intended for the use in business communications. You will learn how culture shapes assumptions and expectations about business and will be able to brainstorm multiple ways to communicate and build relationships around the world more effectively. Interactive exercises will allow participants to experience cultural differences in a first-hand and fun way. Dr. Ibrayeva is an expert in cross-cultural management and has contributed to several studies including “Culture, Leadership, and Organizations: The GLOBE Study of 62 Societies”. For more information on power lunches and professional development offered by the Executive Education program, visit: https://business.unl.edu/execed.